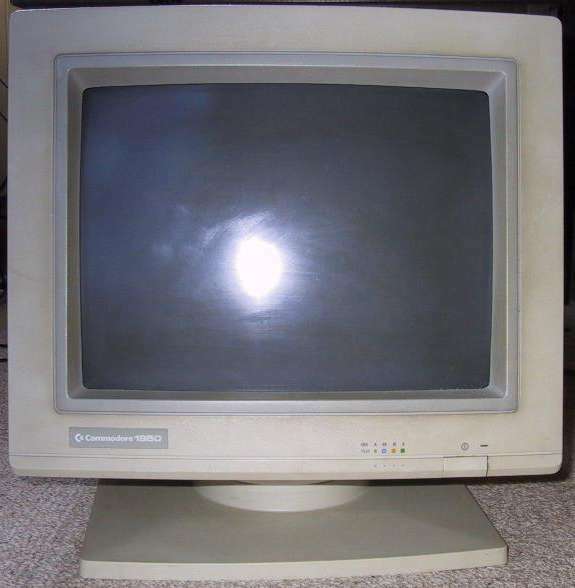 The Commodore 1950 is really a rebadged AOC CM314 with an Hitachi made tube. It is a 14" monitor which supports 15Khz - 35Khz horiztonal and 50Hz - 80Hz vertical. It has a dot pitch of 0.31. A sync problem may be caused by the monitor detecting sync on the Green input and then disabling the horizontal and vertical sync inputs. Removing the 10K R854 resistor or the 10uf C812 capacitor on the small vertical board may fix this. It may also cause problems of its own, so be warned. The analog/TTL switch appears to be prone to failure. However, if switching the switch brings back the picture, it may actually be that the 74LS123 (IC805) on the same board is failing. The suggested course of action is to replace (or at least resolder) this chip first, since it's a commonly available part. A defect in the way the 74LS123 is mounted may be present; there should be +5V on pin 3, but the way the chip is mounted or the board is manufactured, it may be intermittent. There should be a PCB trace between pin 3 and pin 16, however, pin 3 is not soldered to this trace, but only friction-fit (non-plated-through holes?). When the analog switch is moved, it causes intermittent contact between pin 3 and the trace. A soldered jumper to pin 16 is an easy way to fix this, or you may be able to solder to the trace already present. Another common problem is the failure of a multifunction sync chip. Replacements should be available from Sony. The high-voltage boards may crack; this can be one cause of the monitor that starts working when you hit it. A 1 megohm resistor in the second power supply's startup circuit goes bad, causing the monitor to remain dark. Replacing the resistor with a higher wattage one may help prevent the problem in the future. Page contributors: Greg Scott (National Amiga), Ola Jensen, Warren Block.